It's the final month of the year! Can you believe how fast that went?? I can't! I have been counting down the days until I go on vacation and move into my new house, and they are both going to suddenly be upon me in no time. So for the final month of the year, here are some of my goals. Well obviously I need to accomplish this or I am the worst. Haha it doesn't seem like much but baby steps people! 3. Purchase the rest of our IKEA furniture! This is based on whether Josh & I have time in between our busy schedules of work and general activities, as IKEA is a day trip, 2.5 hours away. MERRY XMAS.. The most stressful time of the year. Where I get to travel between 3 houses in one day and try and spend an appropriate time at all of them, while still not completely abandoning my mother who basically only has her daughters, and her parents. OH and Eggnog! I've never made eggnog before. I have some great recipes for all three that I would love to have a go at, so hopefully I can make those a reality. Hey, nice goals and blog.I'm your follower on Bloglovin and would love if you could follow me back there and also on Instagram.In waiting for you on my bog. These sound like some great December goals. Haha I don't think I have any. I really hope you get your 75 followers or more, and I also really want to see those baked goods on this blog. I came across your blog while reading another :) great post, I've always wanted to make eggnog too! Nice goals! You can do it. Easy peasy! I now want to bake gingerbread and cinimon rolls! I also want to make a ginger bread house aha! i can relate to so many of these and so want to make cinnamon rolls! 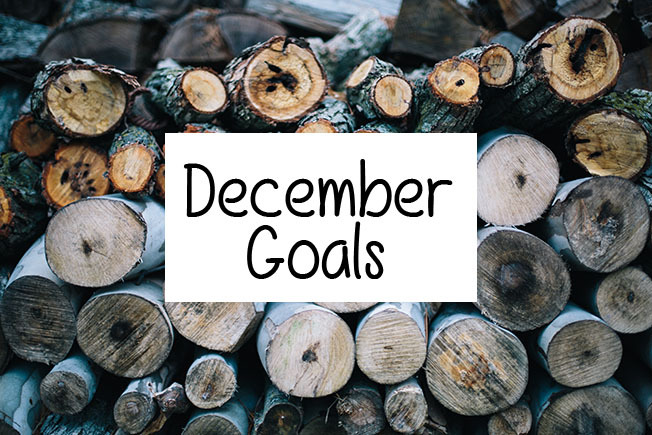 I love these types of 'goals' posts, they inspire me to assess my own goals - I love doing that every so often to ensure that they're attainable, it helps to keep me motivated and on track :) I definitely agree with the last one, eat that gingerbread and those cinnamon rolls, guuurl! Ooh, that's got me in the Christmas spirit. :D Think I'll need to do some baking this weekend too! I feel like you would be so interesting to watch on YouTube. I really love watching these kids of goals and haul style videos. I wish I had the balls to do it but hate watching myself back in film! Great idea for a post. Cinnamon rolls are the best - I hope you get around to doing this because you won't be sorry! Yum! !